Bell, Rogers, and Telus have been collectively taking out full page advertisements in newspapers all summer long. You may have seen their most recent one, and I must say, it’s elegantly laid out. It’s split into two simple columns: on the left there is a picture depicting two kayakers navigating Maligne Lake, Alberta, which rests beneath Llysfran Peak, Mt. Charlton and Mt. Unwin. * Meant to conjure up a sense of pride in our nation’s vast, pristine and resource-laden wilderness, the image instead gave me another thought altogether: how many bars are those people getting on their phones? I hope those paddlers have experience in the back country, because if they needed to call for back up around Maligne Lake, they’d find that there is no wireless service there at all, despite its popularity as a tourist destination. Will foreign competition bring down prices in the long term? This question is up for debate (See here and here)**. One thing that’s certain, however, is this: Canadians are fed up with the status quo. Today, the CRTC refrains from regulating the rates we pay for wired and wireless services where it deems the market to be competitive. But for most of the 20th century, policy makers recognized that promoting competition was just one of many tools available for creating balanced telecom policy, and there were strict regulations in place to protect the public interest “for the social and economic benefit of all Canadians.” The CRTC and its predecessors, as well as provincial utilities boards strove to ensure universal availability and affordability of telecommunications services by using such measures as rate of return and price regulation – just like the rules for, you guessed it – running water. Right now we’re paying high prices for wireless services that rarely live up to advertised standards, and often wind up costing more than expected to boot (due to added on fees for long distance, data overages, and roaming, for instance). A tightly knit group of large companies has got exclusive control over 85% of the portion of our nation’s spectrum resource that’s allocated to telecommunications. Control over spectrum translates into dominance of the wireless market, reflected by the incumbents’ combined share of both revenues and subscribers. In other words, they’ve got the market cornered, and are currently enjoying profit margins of nearly 50% as a result. It appears Bell, Rogers, and Telus would rather spend a fortune buying advertising that denounces the government’s attempts to provide relief for consumers than risk losing the ability to collect economic rent from customers when faced with the mere possibility of pressure from actually competitive markets. We trust these companies to make efficient use of our public resources for the social and economic benefit of all Canadians, and this is how they act? 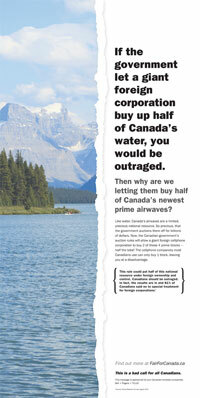 The incumbents must really think of spectrum like water; they’ve been using it to soak Canadians for 30 years! Right now we’re stuck with Bell, Rogers or Telus, but will a foreign corporations’s flavour be better? I’m not so sure. Perhaps it’s time we start thinking about alternatives; let’s turn on the metaphorical tap. The government has been busy for years trying to prime the pump (by courting competition), and in the meantime Canadians are still waiting to see what comes out. Coming up in part 2 : What’s the government going to do about it? *Thanks to Reddit users RambleMan and rush22 for finding where the picture was taken! **These articles appeared alongside each other in this weekend’s Winnipeg Free Press. *** Quoted in Taylor, Gregory, “Oil in the Ether: A Critical History of Spectrum Auctions in Canada,” Canadian Journal of Communication, Vol 38(1). 2013. pg 124. No foreign corporation will ever own half of Canada’s spectrum. Straight from George Cope, CEO of BCE: “No incumbent telco in the world will ever be owned, probably, outside its sovereign country.” No foreign corporation will ever own half of the sliver of Canadian spectrum used for telecommunications. What we’re talking about here is the possibility that a foreign company may be able to purchase rights to use up to half of a particular set of frequencies soon to be up for auction, which themselves represent a diminutive amount compared to those already held by Bell, Rogers and Telus. Wind Mobile is owned by Vimpelcom, a Russian telecommunications company headquartered in the Netherlands. Despite having an international subscriber base similar in size to that of Verizon, since 2008 Vimpelcom’s Canadian subsidiary Wind has only been able to claw a vanishingly small amount of subscribers away from Bell, Rogers, and Telus, and operates mainly in Canada’s lucrative urban centres.